Keeping A&D programs on track is highly challenging. This eBooks looks at the impact of executive visibility on identifying and correcting development issues earlier. 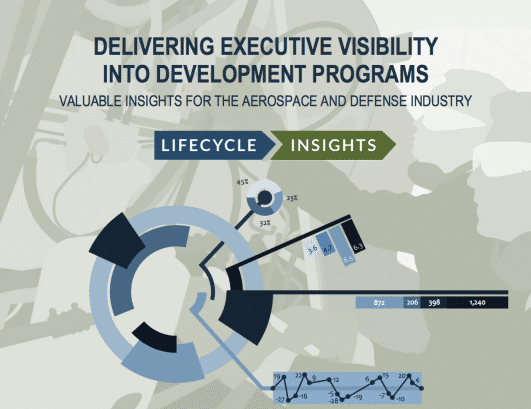 This eBook is of most value to executives that must execute and deliver development projects in the aerospace and defense industry on time and under budget. I need insight into development programs. Now. For anyone working on development programs, that has become an all too familiar demand from executives in any industry. They want reports. They want visibility into the current state of programs. They want key metrics formulated to measure progress and support decision-making. While those efforts can be burdensome at times, the demand is certainly warranted. Today’s technologies, processes and supply chains are overwhelmingly complicated and generate massive amounts of diverse data. As a result, executives are turning more towards metrics as a means to measure progress and root out operational barriers undermining success. They want an up-close look at the specific stages of the process, and they want it in real time. Yet, they also want a birds-eye view into the overall current state of the development. In the aerospace and defense industry, executives are increasingly under pressure to deliver on growing demand despite the need to hold the line on costs. Executives must get programs up and running fast. Then, they must maximize their uptime. All while coordinating thousands of employees at hundreds of suppliers and continuing to fulfill the insatiable need for more innovation. While more transparency of these projects is warranted, it isn’t easy to deliver. The data generated over the course of a development program is in a myriad of formats. It exists in a wide range of locations, on desktops, in emails, in enterprise systems. To make programs more transparent, not only must this information be aggregated intelligently into a composite view, it must be presented in the context of a particular configuration or specific project. Finally, it needs to be visually depicted and delivered in a manner that executives can easily grasp and digest, that enables them to see the big picture while maintaining the ability to drill down into fine details.